Yarn Type SALE 25% OFF! Truesilk is made with 100% mulberry silk making it light with a natural sheen that is found in silk. The yarn is a chainette type construction which means the knitted garments hold their shape and drape gracefully on the body. Hand Wash.
15 designs for women by Martin Storey using Rowan Truesilk. A luxurious, 50s & 60s cruise inspired collection of fourteen Womens handknit designs plus accessories. 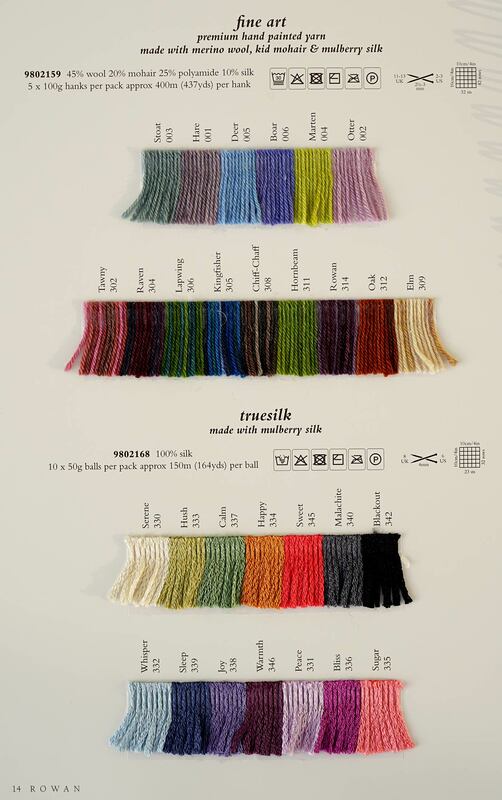 Truesilk, a 100% mulberry silk, chainette yarn which comes in a powdered palette of delicious, ice-cream pastels and deep Jewel like contrasts. A-line shirts, cropped sweaters, lace-knit cover ups, neat little cardigans and glamorous accessories feature throughout the brochure. This is Rowan in the Holiday spirit - relaxed, soft and colourful.